We’d love your help. Let us know what’s wrong with this preview of Stolen Continents by Ronald Wright. To ask other readers questions about Stolen Continents, please sign up. Only a couple of pages of this book were enough to bring me to the reality of the holocaust, the author's own word, that these "Indian" Americans have been going through since. Stones forced into eye sockets, infants kicked around as soccer balls, the soles of teen's feet shaved off, ...etc. These gruesome acts might seem safely secured in history by the centuries that now separate us from the time Columbus first landed on the Americas. However, these acts are only from the 20th century (covered Only a couple of pages of this book were enough to bring me to the reality of the holocaust, the author's own word, that these "Indian" Americans have been going through since. Stones forced into eye sockets, infants kicked around as soccer balls, the soles of teen's feet shaved off, ...etc. These gruesome acts might seem safely secured in history by the centuries that now separate us from the time Columbus first landed on the Americas. However, these acts are only from the 20th century (covered near the end of the book). I think this is what distinguishes this work from other historical books, in that it delivers the whole image of struggle that these indigenous nations have gone through since 1492 to modern day resistance in 1992. Five different empires are the subject of this examination: Aztecs, Mayas, Incas, Cherokees, and Iroquois. This is by no means an exclusive list, far from that, many more nations and tribes have had the Americas as their home. Estimates of the populations of these continents range from 70 million to over 120 million, a third of the world's populations then. Reduced to roughly 20 million after only 60 years. Overall the book was clearly a result of some extensive and extra ordinary research, for example going into the Vatican Secret Archives for sources, and at times portraying contradicting narratives of the same encounter: see the bottom of page 22 for a really funny comparison between the Spanish and Aztec narrative. Although I am tempted to give it a five out five star ranking, I think some of chapters could have used better transitions and where hence hard and slow to digest. Heart-wrenching. I am a descendant of the people whose struggles Ronald chronicles in this book. Reading this was for me an evisceration of my ignorance, an agony-inducing procedure in which a layer of the cancerous tumor of colonization has been removed from my soul. This book educated me, caused anger, resentment, but more importantly, it nourished my will to become more involved in, not only my own decolonization, but in that of others as well. I won't repeat the book's summary here; I will s Heart-wrenching. I am a descendant of the people whose struggles Ronald chronicles in this book. Reading this was for me an evisceration of my ignorance, an agony-inducing procedure in which a layer of the cancerous tumor of colonization has been removed from my soul. This book educated me, caused anger, resentment, but more importantly, it nourished my will to become more involved in, not only my own decolonization, but in that of others as well. I won't repeat the book's summary here; I will say only two things. 1) If you are a POC (Person of Color), especially from "Latin" America, and you live in North America, or in Europe, and you've never researched our continent's history outside a curated school context, this book will introduce you to what created the conditions that led to your parents leaving their land. It will likely open a door of awareness that will hopefully never close again. My hope is that it will inspire you to uncover more about your roots. Probably a little one sided as it says little about the atrocities committed by native Americans before, during, or after invasion - although they are touched on briefly. On one hand I think ‘so what?’ It was their country. On the other, I’m intelligent enough to realise that there was no golden age of human civilisation in any part of the world at any time and I feel that omission of those details suggests that there was. Despite all that this is one of the best books I’ve ever read. It contains Probably a little one sided as it says little about the atrocities committed by native Americans before, during, or after invasion - although they are touched on briefly. Despite all that this is one of the best books I’ve ever read. It contains all the information American history books are still too afraid to mention. If a child ever complains that north America has no ancient history hand them this book. I’m sure I shed a tear at the end. Beautifully written and a real shame that it had to finish. One of those long pause and reflect moments. I have to admit that this has been one of the more depressing things I have ever read, provoking a reaction similar to what I experienced while watching Hotel Rwanda. It also provided some insights, which directly challenged the received wisdom that I had accumulated from other sources. Turns out I can't trust JT Edson. Wright looks at the effects of the conquest upon what he deems to be the five major societies or states that existed at the time of contact. The five groups were the Incans, Maya, Aztecs, Cherokee, and Iroquois, each representing a different type of state, ranging from loose tribal federation to centralised Imperial power. Each of the five groups is examined at three different periods in their history of contact, and their progress or decline noted. The key observation being that whenever this decline has been stabilised or slowed the indigenous group again suffers European (initially external or settler) attack or oppression. It just never seems to stop. 1. Cultural genocide was practiced by the occupying Europeans, often till quite recently. Offenders include the occupying power, the local state and the various Christian religious groups, specifically the Catholic Church, and more recently evangelical Christian movements. 2. The inability of indigenous American populations to throw off the occupying powers in the way that African or Asian colonised peoples did is largely due the massive population loss. 3. In many American countries the occupying European settlers created a regime of racial preference similar to the racist regimes of apartheid South Africa and Southern Rhodesia. Such systems exist to this day, but gather little international attention. There were three things that surprised me, the scale of the deaths due to imported illnesses, the deliberate cultural genocide, and how long this state of affairs has lasted. The last two of which were especially surprising. I find it incredibly hard to believe that people could systematically destroy other cultures in the way that Wright states, but it apparently did happen. After all, long term occupation and exploitation is hard if the indigenous people are still rebelling. The most shocking part for me was the stories of the Inca and Aztec, how complete their destruction was, how long they have been brutally oppressed by their occupier. The fact that any part of their culture or history still exists is a surprise, and is probably due to the sheer scale of their populations pre contact. It is similar in scale to the collapse of the Western Roman Empire, the sack of Greater Iran by the Mongols and then the Turks. These societies, populations and quality of life have only really recovered to close to pre contact levels since the mid 20th century, and even then not really. To be constantly confronted by the raw facts and figures of the conquest of the Americas, to put a number on the dead, to see listed the crimes, that is a shocking thing. As a resident of a settler nation that has recently examined its relationship and history with its indigenous population I should not be really surprised by this book, but I am, probably due to the scale of the events. They totally dwarf anything that I have read about in New Zealand or Australia (this is not meant to insult indigenous readers). You want to hope that the litany of tragedy lies in the past, because the modern world would not allow such events to still occur, but it is not to be. The Canadian Mohawk rebellion of 1990, then the Zapatista revolt in Mexico are but two examples of the dissatisfaction that still exists. We may live in the 21st century, but the crimes of the early Modern era still haunt us. Wright delivers this information extremely well, using a combination of emotive language and cold, hard facts. The three-era/five-group structure lets Wright keep the events in context to what happened to other groups. This works well, it allows each group’s experiences to reinforce each, it gives a point of comparison. Lest the reader dare think that the terrible events were isolated, that others had it better. The reader is never given the opportunity to think that. To call it compelling reading is an understatement, it is impossible to put down. Read this book if you want to know the sordid truth about the colonisation of the Americas. Truly remarkarble book that tells the story of the 'discovery' of the Americas through Indian eyes. As history is always told by the victors, 1492 is seen as the beggining of the 'modern world' with all positive connotations associated with it. But, for the First Americans it was the beggining of an invasion, repression and genocide that continues to this day. More than 90% of the original American died through diseases and direct killing. Ronald Wright tells us the story of the conquest as it w Truly remarkarble book that tells the story of the 'discovery' of the Americas through Indian eyes. As history is always told by the victors, 1492 is seen as the beggining of the 'modern world' with all positive connotations associated with it. But, for the First Americans it was the beggining of an invasion, repression and genocide that continues to this day. More than 90% of the original American died through diseases and direct killing. Ronald Wright tells us the story of the conquest as it was seen by five native peoples (the Aztec, the Maya, the Incas, the Cherokee and the Iroquois) using the records that survived the invasion. For the Indians, the arrival of the Europeans brought disease, killing, subjugation and treachery. Treachery was commonly used especially with the Cherokee and the Iroquois. Time and time again these nations were forced to sell their territories being promised that they would never be bothered again. Their territories were gradually reduced until they were incorporated in the alien country. It's remarkable the hypocrisy of these governments when they use treaties in trial signed by the Indians because they had no choice and discover that they constantly broke them. During the 19th century, governments in Mexico, the US, Peru, Canada introduced the notion of private property and abolished all communal lands in the name of 'progress' and 'civilisation' which seriously damaged indigenous systems. This opened more land for the purchase of white settlers. Farming became more 'efficient' but the soil was seriously depleted within a century and farming is not an option in the areas affected. This is still happening but, now, on a global scale as peasants are driven out of their lands or forced to plant cash crops in order to make farming more 'efficient' (and to deplete the soil much more rapidly). One of the most interesting parts of the book is when the author describes the food distribution system of the Incas and how effective it was. Also, at least with the cases studied, native american beliefs didn't proclaim they had the sole truth unlike Christianity. What missionaries did was, indeed, to try to destroy a culture. However, the most curious part of the book is about how the Cherokee 'civilised' themselves installing a parliament, schools, hospitals and adapted their language to writing. They hoped this would save their culture from being incorporated in the US expanding imperial force. Nevertheless, the US government still considered that the Cherokee were under their jurisdiction as they now feared that these 'civilised' Indians could become a threat. It didn't matter what they did, they were doomed all along. The White man wanted more land. As Wright says, if the US was twice its size, all the land would still have been seized. There were various instances of intended cultural genocide among all the peoples portrayed which the author describes very well. The amazing thing is that they managed to survive (some better than others) although the majority was assimilated into the mainstream culture. Neither the conquest nor the resistance is over. Indigenous peoples in the Amazon are being threatened by logging. But, finally, Indians are taking over some of their countries such as Peru and Bolivia. Is that a hopeful sign? Only the future will tell. Ronald Wright is an excellent writer and this is an absorbing book. Wright tells the story of colonisation in America by focusing on the histories of five Indian civilisations - Inca, Maya, Aztec, Cherokee and Iroquois. These civilisations were chosen because they were the most complex societies at the time of first European contact and thus have left the best records. The book is structured into both chronological and geographical divisions. Wright describes the three chronological divisions as Ronald Wright is an excellent writer and this is an absorbing book. Wright tells the story of colonisation in America by focusing on the histories of five Indian civilisations - Inca, Maya, Aztec, Cherokee and Iroquois. These civilisations were chosen because they were the most complex societies at the time of first European contact and thus have left the best records. The book is structured into both chronological and geographical divisions. Wright describes the three chronological divisions as corresponding roughly to the initial assault, the colonial period, and the period since the founding of settler republics. The geographical divisions correspond to those of the five civilisations - Inca in South America, Aztec and Maya in Central America, and Cherokee and Iroquois in North America. This book shows us in chilling detail how each of these societies was brought to the brink of destruction by their European colonists, and how they have been kept in a state of disenfranchisement and subjugation ever since. Prior to European contact each of these five societies were high functioning and successful. With the exception of the Aztecs their way of life was based on social values very different from those of their invaders - communal land ownership, redistribution of wealth from the more able to the less able, advancement through merit, social equality, and living in harmony with the environment. The European invaders were lured to this land by greed for gold and land, an arrogant disregard for the rights of the existing inhabitants and a self-righteous belief in their religious and cultural superiority. They also brought deadly gifts from across the ocean - smallpox, measles, influenza, bubonic plague, yellow fever, cholera and malaria. The Indian people had virtually no resistance to these diseases and the effect on their populations was devastating - by 1600 less than a tenth of the Indian population remained. This was a turning point for the Indians. With their populations decimated they had no chance of defending their way of life from the colonising Europeans. Colonisation meant what it has meant all over the world - loss of land, loss of language, loss of history, culture, knowledge. Loss of power. The consequences are also the same all over the world - poverty, persecution, suppression, discrimination, alienation. Despite all this, remnants of these civilisations remain. Against all odds they have managed to retain their language, their traditions and beliefs, and knowledge of their history. But without land and sovereignty they are mere shadows of the societies they once were. This book was written in 1992 and ends on a faint note of hope that things may be improving for the native peoples of this continent. Unfortunately I don't think that much progress has been made over the last 19 years. It would be great to have an update. This history of the conquest and resistance of Native Americans alternates between horrifying and boring. I knew some of the harrowing tales of mistreatment of Native Americans by the Europeans, but some of the tales in this book still shocked me. It makes me feel cynical about human nature. However, most of this book was fairly drab. The author was clearly very fired up about it, but he failed to infect me with the same passion for the subject. One of his goals, and I suppose it was partially ac This history of the conquest and resistance of Native Americans alternates between horrifying and boring. I knew some of the harrowing tales of mistreatment of Native Americans by the Europeans, but some of the tales in this book still shocked me. It makes me feel cynical about human nature. However, most of this book was fairly drab. The author was clearly very fired up about it, but he failed to infect me with the same passion for the subject. If it's not too strange a statement with which to open a book review, this is more the kind of read that I was hoping for from the much more well known Bury My Heart at Wounded Knee: An Indian History of the American West. Where 'Bury...' seemed content with bombarding the reader with facts and history, this book on almost the same topic actually makes a point of humanising the main protagonists, making this feel a much more personal book than the relatively staid aforementioned alternative. This If it's not too strange a statement with which to open a book review, this is more the kind of read that I was hoping for from the much more well known Bury My Heart at Wounded Knee: An Indian History of the American West. This book also scores points over Bury My Heart by including the stories of the Inca, Aztec and Maya too which filled in a lot of grey spaces in my knowledge. A great overview of the history and what happened to 5 different people groups native to North America when the Europeans arrived. I gained knowledge and respect for the various people groups and their uniqueness. For example, the first zoo was discovered in Mexico by the Europeans. Also, the Mayans had a complex way of measuring time, involving three different calendars. A caution to the book is that the author is obviously hostile towards Christianity bringing its message to the "New World". This is by far, the most education I've ever received on aboriginal history. I am so glad I opened this book. It took me only a couple of days to finish because it's so easy to read and so interesting. Wright has the reader follow the Inca, Maya, Aztec, Cherokee and Iroquois from 1491 until 1990. It was so refreshing to read history from a different perspective. It's about time, too! I wish I had heard about it sooner. A history of the European encounter with five American Indian nations - the Aztecs, the Maya, the Inca, the Cherokee and the Iroquois. There are fifteen chapters in all, with a chapter on the European conquest of each nation, their fates under the conquest, and the current situation. The book starts with Columbus, Cortés, Pizarro, Moctezuma and Atawallpa, and ends with Sendero Luminoso, Rigoberta Menchú Tum and the Oka crisis. "Extremely fascinating" is not strong enough an expression; among oth A history of the European encounter with five American Indian nations - the Aztecs, the Maya, the Inca, the Cherokee and the Iroquois. There are fifteen chapters in all, with a chapter on the European conquest of each nation, their fates under the conquest, and the current situation. The book starts with Columbus, Cortés, Pizarro, Moctezuma and Atawallpa, and ends with Sendero Luminoso, Rigoberta Menchú Tum and the Oka crisis. "Extremely fascinating" is not strong enough an expression; among other things I didn't know, this book tells that Atawallpa intended to breed the Spaniards' horses and make the Spaniards into court eunuchs, and he would have done so if it hadn't been for the smallpox epidemic; that the first great American book in a European language was the story of the De Soto expedition written by the son of one of Atawallpa's cousins and a Spanish captain; that the Aztec priests of Quetzalcoatl challenged the Franciscan friars to a debate, a Nahuatl record of which lay unnoticed in the archives of Vatican until the twentieth century; that in 1923 an Iroquois delegation went to the League of Nations in Geneva to ask for the international recognition of their nation, and some delegations including that of Estonia favored it. Wright stresses several times that Tzvetan Todorov's book on the conquest of the Americas is very ignorant; well, what can you expect from a postmodernist philosopher? What I found missing is the discussion of the irony that permeates much of the modern white-indigenous relations. For several years I went to an English-language Internet forum, one (still active) participant of which was a Cherokee (although her father and maternal grandfather were white); she was a locally prominent America- and white-basher (for example, after 9/11 she said she hoped the United States gets nuked). Yet in February this year she wrote (I just checked; I hope she doesn't mind me quoting her), "Ward Churchill literally disguised himself as an American Indian to shield himself from criticism of his extreme anti-Americanism for decades. He is an obvious crackpot, but no one would call him on it for fear of appearing racist." Isn't this fear is the defining characteristic of the white-indigenous relations in the non-European Western world nowadays? In the 2005 afterword Wright notes that although some of Rigoberta Menchú Tum's specific claims were found to be lies, the larger picture she showed was correct. No, Rigoberta's critics claimed that it was not correct; otherwise, there would have been no reason for her to lie. In the 16th century the Spanish used Indians to provide slave labor in silver mines; are the Americans now using Indians to "provide rebels in far-off places, into whom careerists can project their fantasies of rebellion"? The focus of the wrongs done to Native Americans, thanks perhaps to Dee Brown’s “Bury My Heart at Wounded Knee , tends to be on the Victorian 'West' in the United States. Wright reminds us that the “Indian Wars” , even in North America lasted for two and a half centuries and not just the thirty year period after the Civil War. In South and Central America it started in the 15th century. The fighting in the eastern United States both in colonial times and after independence seems to have been more The focus of the wrongs done to Native Americans, thanks perhaps to Dee Brown’s “Bury My Heart at Wounded Knee , tends to be on the Victorian 'West' in the United States. Wright reminds us that the “Indian Wars” , even in North America lasted for two and a half centuries and not just the thirty year period after the Civil War. The fighting in the eastern United States both in colonial times and after independence seems to have been more extensive with greater casualties on both sides than in the West where some battles were, by comparison, no more than skirmishes. One of the European justifications for the ‘stealing of these continents’ was that they were sparsely populated. I had not realised that in North American diseases introduced by the Spanish to the south and by casual contacts in the north with European traders and fishermen had wiped out huge numbers of Native Americans so that the population was considerably depleted even before the English landed in Virginia and Massachusetts . In North America too this age old conflict is still some way off resolution. In 1990 not 1890, the town of Oka in Quebec attempted to take land historically Mohawk in order to extend its golf course. The resulting conflict escalated to the point where 4000 Canadian troops, complete with tanks and helicopters besieged Mohawks , more soldiers than the US deployed against Sitting Bull. It seems it was the common sense of the Mohawks rather than any sensibility on the part of the Canadians which prevented a bloody battle to equal anything in the Indian wars of the preceding centuries. This is a well written, well researched book. It taught me much I did not know and gave me new perspectives on things I thought I knew . I think it is essential reading for anyone interested in the history of the Americas. Phenomenal account of Native America. The real, gruesome, harrowing and ongoing colonial struggle is all herein: as told by the experiences of 5 peoples (Iroquois, Aztec, Maya, Inca and Cherokee). Mr. Wright writes mostly with a political history perspective, with a lot of military description. He creates an effect that is truly bold and if not an exhaustive history then at least a cautious look at the lasting effects of 500 years of colonization. This is vital information for any student of pos Phenomenal account of Native America. The real, gruesome, harrowing and ongoing colonial struggle is all herein: as told by the experiences of 5 peoples (Iroquois, Aztec, Maya, Inca and Cherokee). Mr. Wright writes mostly with a political history perspective, with a lot of military description. He creates an effect that is truly bold and if not an exhaustive history then at least a cautious look at the lasting effects of 500 years of colonization. This is vital information for any student of post-colonial literature, race relations, capitalism and obviously Indigenous people. I recommend this for all Americans- North and South. If you are white, be warned, the history here wil bring you to bow your head in utter shame for the violent mayhem Europeans wrought in the New World. If you are a Native, fear not, you may have an incredible amount of inspiration to find in these pages, especially in the sections on Native resistance. It is hard to believe that when Columbus "discovered" the Americas there were already 100 million natives in North and South America. A very interesting and thought provoking book. It is an overview of the Aztecs, Mayas. Incas, Cherokee and Iroquois from their first contact with Europeans to today. The book is divided into Invasion, Resistance and Rebirth. It covers a lot of territory but is a good primer for anyone interested in the issues. Recommends it for: anyone interested in having a balanced view of the history of North America. Much of this was difficult to read as it is hard to imagine people being able to behave so badly and treating other people the way many Europeans (maybe most) treated the actual Americans, the Amerindians. It was well written and read more like a riveting story than a heavy history. There are lots of quotes from primary sources which add to the experience. 4/5 Spuds. An excellent book and well researched if somewhat sentimental at times. Told mainly from the perspective of the various Amerindians during the colonial/conquest era, this book traces the history of the five main American Indian civilizations, the Aztecs, Mayans, Incas, Cherokee and Iroquois from the time of Columbus to the present day. A sobering view of Aztec, Maya, Inca, Cherokee, and Iroquois cultures through conquest, resistance, and rebirth (could an honest history be anything else?). I found it impossible to not dig into certain areas more deeply as I read. Much of my curiosity also stems from my Mexican and Colombia roots. I think this is the last push I need to do 23 & me. It is totally shocking how the history of North America has been completely re-written to erase the incredible treatment of the highly developed and civilized societies that existed here before the arrival of the Europeans. Everything we were taught in school about the native peoples of this continent was a lie. 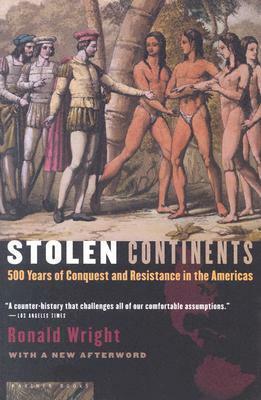 If it were written with just a smidgen more objectivity I would have liked it even more, but as it is, Stolen Continents is a fascinating account from the perspective of the conquered native peoples in the America, based on a number of primary sources that I hadn't realized even existed. Comprehensive analysis of the near genocidal invasion of the Americas and their resistance. It is nice to hear the voices of aboriginal folks from North, Central and South America, as a good counterweight to the official story which often erases them and their contributions. Excellent book. Should be required reading for all high school students. I had totally forgotten Canada's poor performance with the Six Nations during the early 90s. One more gringo debacle to add to the list of shame. Well written and engaging, Wright makes good decisions about how to cover 500 years in a few hundred pages. We know the resistance continues, but great to see how clear today's actions connect culturally, politically and strategically to the those first contacts. Ronald Wright is a Canadian author who has written books of travel, history and fiction. His nonfiction includes the bestseller Stolen Continents, winner of the Gordon Montador Award and chosen as a book of the year by the Independent and the Sunday Times. His first novel, A Scientific Romance, won the 1997 David Higham Prize for Fiction and was chosen a book of the year by the Globe and Mail, the Ronald Wright is a Canadian author who has written books of travel, history and fiction. His nonfiction includes the bestseller Stolen Continents, winner of the Gordon Montador Award and chosen as a book of the year by the Independent and the Sunday Times. His first novel, A Scientific Romance, won the 1997 David Higham Prize for Fiction and was chosen a book of the year by the Globe and Mail, the Sunday Times, and the New York Times.